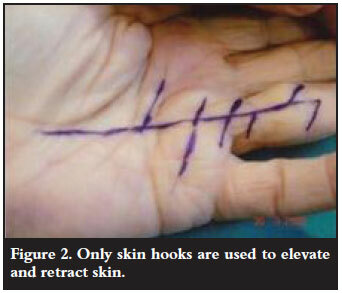 Dupuytren's contracture (DC) or palmar fasciitis is notorious for its high recurrence rate after surgical fasciectomy. In a personal series of 426 operated hands over a 15-year period with a follow-up period of 2 to 17 years, the recurrence rate was only 3.7% (in the literature: 26-63%). The demographics, surgical technique and results are discussed. It is suggested that the possible reason for the low recurrence rate lies in multiple Z-plasties. Over a 15-year period (1991-2007) and a follow-up of 2 to 17 years, 436 patients (601 hands) were seen and treated conservatively or surgically (426 hands, i.e. 71%). 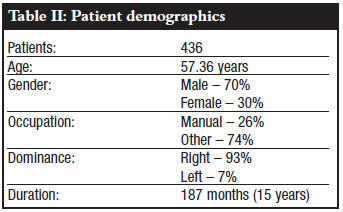 The patient demographics are reflected in Table II. 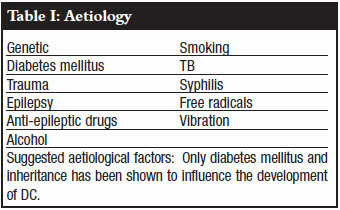 Table III gives the sites affected while Table IV shows co-morbid conditions. In an international study, the typical DC patient was a white male of north-European origin, 57 years old, with a 10-year history and bilateral involvement but not symmetrical.2 The dominant handedness and diathesis factors were irrelevant. Our 'typical patient' was very similar to the 'international patient', although the average period before seeking help was a little longer (15 years). An indication for surgery was when a finger or fingers caused interference with work or activities of daily living due to the flexion contracture. The decision to operate was not based on the fingers reaching a certain degree of flexion contracture, but was left entirely to the patient to decide when the finger(s) 'got in the way'. The second indication for surgery was when one or more fibrous nodules became tender or painful due to pressure from instruments or tools and thus caused discomfort. 1. 2.5 x magnification with loops. 2. 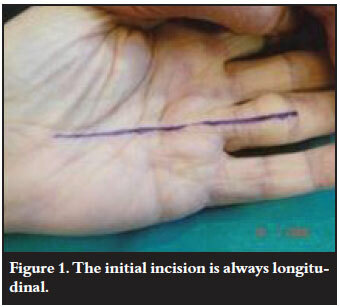 Longitudinal skin incision along the entire band from proximal to distal (Figure 1). 3. Complete and very meticulous fasciectomy of all pathological tissue using only skin hooks (Figure 2). 4. Multiple Z-plasties, at least over all the skin joints (Figure 3). 5. Thorough homeostasis with bipolar cautery (cauterant). 6. Multiple fine sutures with a rapidly dissolvable suture (5/0 in males; 6/0 in females). 7. 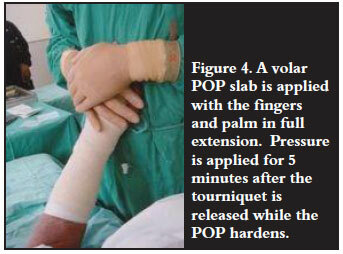 Well-moulded volar slab with fingers in full extension and five-minute compression after tourniquet release (Figure 4). The slab is removed after 10 to 14 days. 8. Rehabilitation by a qualified hand therapist is recommended, especially in the case of those patients with diabetes mellitus. 9. Back to work as soon as possible. Recurrence indicates 'regrowth' of DC tissue in the area of previous surgery. Our rate was 3.7%, whereas the rate in published literature ranges from 26 to 63%. 'Extension' refers to new growth of fibrous tissue outside the area of previous surgery. In our series this occurred in 4.8% of hands operated (in the literature 2066%). 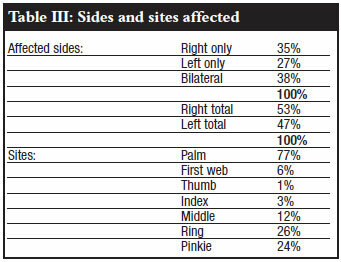 The complications included haematoma formation in four hands (0.9%) and skin breakdown in two hands (0.5%). The patient satisfaction was evaluated on a visual analogue scale (VAS). The overall VAS rate (110) was 9.2, i.e. 92% were satisfied. The aim of this article is not to give an in-depth account of DC as it is adequately covered in textbooks and numerous publications. The purpose is to emphasise certain crucial points in the surgical management that are essential for a better outcome and long-term results. 1. 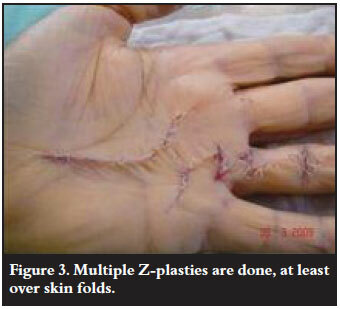 A longitudinal skin incision must be made that is converted to multiple Z-plasties. It makes no sense to start with a zigzag or Brunner-type incision. This incision does not break the longitudinal lesion or tension. A 60º60º Z-plasty gives about 100% more length. Since collagen tissue responds adversely when stretched, it is imperative to remove any possible longitudinal tension.1 It is only possible to achieve this by a Z-plasty or skin graft (which is not necessary, and has its own drawbacks). 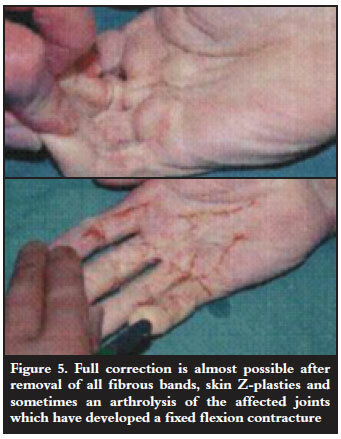 It was possible to fully correct the most severe contractures by Z-plasty lengthening alone. Skin grafts were not used in any of our patients. 2. Magnification is essential. Fibrous bands and nodules usually disturb the anatomy. Magnification makes distinguishing between normal and pathological fibrous tissue easier. 3. Skin should only be elevated with skin hooks. Repeated grabbing with a forceps causes bruising of the compromised elevated skin and results in delayed healing or even skin necroses. 4. Meticulous homeostasis with a bipolar cautery is mandatory. One of the severe postoperative complications is haematoma formation, which may further compromise the skin and/or result in infection. 5. Removing all pathological tissue and Z-lengthening the skin should in almost all cases give full correction, i.e. full extension (Figure 5). Of course arthrolysis of flexed joints may have to be done as well, including release of the volar plate, the flexor tendon sheath and part of the collateral ligaments. 6. Postoperative pressure, while the volar POP splint hardens, prevents formation of a potential haematoma. The splint should be in full extension and remain on for 10 to 14 days. 7. Rehabilitation by a qualified hand therapist is advised to promote mobility, reduce swelling and soften the surgical scar.7,8 Potential formation of complex regional pain syndrome (Sudeck's atrophy) will be reduced with early mobilisation and hand therapy. The results of DC surgery could be very satisfactory with a low recurrence rate if certain basic principles are followed. The most important causes of recurrence and even extension of the fibromatosis are remaining pathological tissue and especially longitudinal tension in the skin and subcutaneous tissue. It is thus essential to meticulously remove all affected tissue and perform multiple Z-plasties of the skin to remove any possible tension.